A new community for rad women and free spirits nurturing our creative selves while hustling this thing called motherhood. i’m standing in front of the bathroom mirror, brushing my hair. everyone else is asleep. this nightly ritual - less than 3 minutes long - somehow feels so indulgent because it’s all about ME. no kids, no partner. just me and my tangly web of hair. i almost get lost in the act of brushing, the rythmic notion is soothing. as i brush, i start to drift into a warm and dense thought-less space. the reflection in the mirror is smiling and i almost wonder for a minute, who she is. it’s so easy to forget her. amidst all the rushing to and fro, the built up and broken down expectations (hi, you’re a mom now!) and half finished pieces of bread, toddler juices boxes and sentences. in the juggle of multi-tasking and in keeping tiny humans alive, motherhood makes you forget what’s important sometimes. like YOU. ME. HER. YOU are important. I am important. SHE is important. this month was a tough one, the mirror reared an ugly face back. with reminders of hopes and dreams that at this moment just don’t seem possible. that half-finished career. that abandoned class pass. that friendship that somehow got lost in the shuffle of no-time, toddler-time, maxed-out time. that choir that i wanted to desperately join but that i just couldn’t swing because monday nights are tough and my kid keeps getting sick and after missing 3 times in a row i was too embarrassed to return. that monthly reminder that i’m STILL not pregnant even though it’s been 1.5 years of (mostly) trying for a second and maybe it just won’t happen. and the entangled notion of shame, wrapped up into a tight top bun as if to not reveal the mess that’s inside, the heartbreak of the miscarriage still tucked in there somewhere, and the conflicted guilt for even feeling this sadness or any of these emotions when i’m living in a world of extreme privilege and where at least i got one happy and healthy child. so i brush, brush, brush. brush it all away. lost strands of hair staring back at me in the sink. in december, we will dedicate our final NYC event on Dec 11 to the theme of Coming Undone. we want to create space to share personal stories of unraveling as they relate to motherhood. have you “come undone” through the process of mom life? have you experienced confusion? anger? regret? guilt? grief? envy? a sense of powerlessness? wherever you are in your motherhood journey, we want to hear YOUR story and honor the process of letting this stuff out. because it feels better when we talk about it, however small or big you may think it is, you carry it with you and you shouldn’t have to do it all alone. speaking of not alone, i will be joined by my new mom crush Alexis Barad who heads up Not Safe For Mom Group (NSFMG) and who does an epic job at navigating, writing, telling and moderating raw, unfiltered stories of motherhood (at NSFMG, nothing is taboo) and who will co-moderate this evening. bringing light into the darkness, we will close the night with a healing candle ceremony. becoming getting together can be powerfully healing. i hope you will join me! for those of you scattered across the US and around the world, we will be sharing some prompts via IG stories this month so that stories can also be shared virtually between all our pom pom mamas wherever you are as well as creating a community sourced playlist and more surprises in the works.... you can also send in your story via email it to us at pompomsocial@gmail.com and we will share it! i’m back, standing in front of the mirror. i loosen my bun, let the hair down and let it fall free on my shoulders, shaking it, the act of release. and then decide to slowly braid it. just like my mom used to do with me. and before that, her mother with her. when we braid hair, the hair becomes stronger. when we join the strands, the collective chain is more powerful than on its own. it reminds me of all the women around me. all the moms, wherever we are. when we come together, we are better. when we are given the opportunity to share, we become stronger. we may not be unbreakable but at least the breaks are more manageable. maybe we can even be each others mirror. we believe in the power of connection. and that great things can happen when creative women join together. as free spIRITS, as risk takers, and as moms who dare to be honest AF. 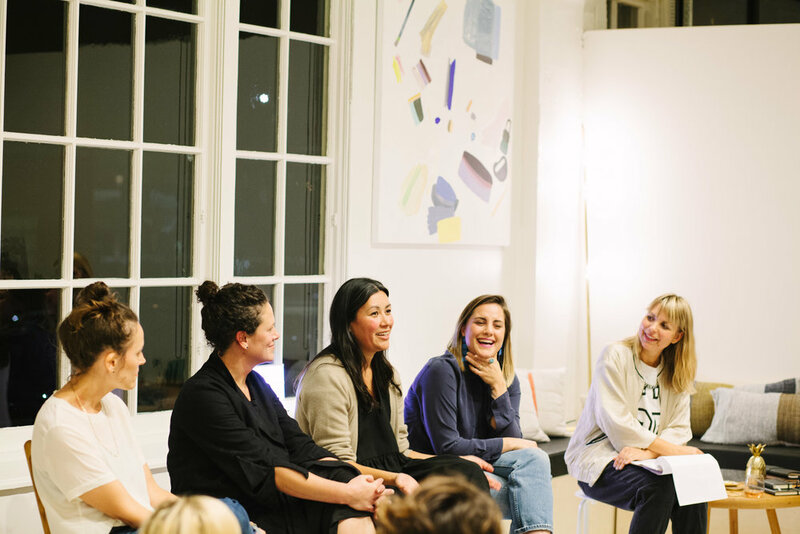 AT Pom pom social, we BELIEVE THE MOTHERHOOD HUSTLE IS BETTER DONE TOGETHER. we know the magic happens IRL. that’s why we host monthly meet ups that foster connection, collaboration & conversation. we hear from speakers and tackle topics related to self-discovery and creativity amidst the mom hustle. we chat, we challenge, and, yes, we drink wine. we embrace the breakdowns and breakthroughs around mom-hood and in having real conversations, about real topics, both in person and through our online and social platforms. we think judging is lame and that moms should be a little nicer to each other. pom pom social was born out of a cheerful spirit and doing our part in ensuring a better future for our kids. we are socially active and believe in joining together to support fellow female-led organizations, sharing insights and in creating memorable experiences that also do good. Sign up for our newsletter to learn more about future meet ups, events and workshops and how you can be an active part of the pom pom social community. Thanks for your joining our community of creative mamas! Stay tuned for monthly updates on events, content and other stuff that we care about. We promise not to overload your inbox. We can't wait to pom pom with you.